Some may be surprised to learn that one of the biggest threats to your business technology is the group of people you’ve hired to work with it. There are a variety of reasons that your end-users can create a security problem through their actions. Vengeance - As melodramatic as it sounds, if an employee is dissatisfied enough by something to do with their job, they might just lash out against the business. Whether that takes the shape of deleting critical files before storming off, unleashing malware into your system, or just breaking some critical component, your business could find itself in deep trouble. Even worse, if the employee thinks ahead about it, they could potentially figure out how to hide their actions until they are long gone, or just access your network later to mess with your business - and the longer an issue persists, the more it will ultimately cost you. The best way to fix this is to simply remove an employee’s credentials the moment they are no longer in your employ - and to mitigate this kind of situation from happening in the first place. If you keep your employees satisfied, engaged in their work, and happy, if they do ultimately leave, it will most likely be a departure spurred by greener pastures elsewhere, and not animosity toward your business. Being Bamboozled - How many of your employees read these blogs, or have gone over our website? Are they up-to-speed on how to best protect themselves against social engineering attacks by cybercriminals? These attacks can be particularly effective, as they take an employee’s instinct to do as they are told and pit it against their ability to shrewdly analyze an incoming message. 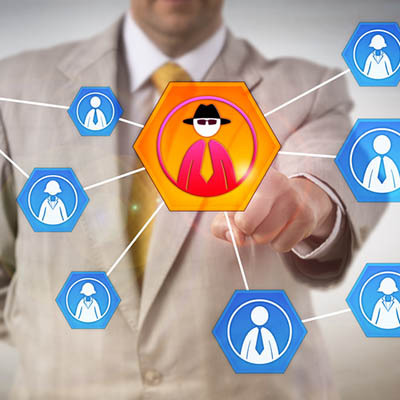 A social engineer will reach out to your employee under the guise of being someone else, as either an authority figure in your company, a client, or another business contact. This allows them to request certain information that some employees would be only too eager to hand over (after all, if the boss is asking for something, you deliver it, right?). The simplest way to eliminate this threat is to make sure your employees appreciate the reality of it, educating them and reinforcing the proper procedures to ensure that information isn’t just given out to someone who asks nicely. Inappropriate/Illegal Activities - Unfortunately, a workstation is not just a great productivity tool. It is also one of the most potent distractions out there, thanks to all the content available online that should not be accessed by someone in a professional environment. From games, to adult material, to social media, to watching x-animal try to mimic y-human activity on YouTube, you are up against a formidable foe if you try to wrangle the Internet. However, it is crucial to your network security that you do so, as threats can be very easily hidden in content that would seem harmless on the surface. Protecting yourself against these threats means that you have to apply patches as they become available, and it can’t hurt to block access to certain websites if you discover that there is a tendency for them to be accessed during work hours. Of course, there’s inappropriate, and then there’s illegal. Unfortunately, unless you can establish that you have taken measures to prevent such activities, any illegal activities performed on a business’ network are the responsibility of the owner. Citibank learned this the hard way, when its employees downloaded materials from the Internet that had absolutely no business being accessed in the workplace. This activity got Citibank sued for $2 million. This is why it is especially important to monitor your network activity, and again, block access to certain sites. You should also keep a documented acceptable use policy, signed by every employee, so that you can legally protect yourself should the need arise. Leaking Information - There are a variety of reasons that an employee could want to take information out of the safe environment of your network. Those with good intentions may just want to get some extra work done at home - but we’ve all heard where the road paved with good intentions leads to. A frustrated employee might decide to take a little something along when they leave to entice their next employer into hiring them. Either way, your data is at risk, so you need to take steps to prevent such activities. A few options are to require permissions for certain devices to access the network, and to require authorization to connect a device to Wi-Fi or Bluetooth within the office. As unfortunate as internal threats inherently are, you need to accept that they are real in order to deal with them. Strata Information Technology can help. Reach out to us at 888.678.7282 to learn about our solutions to your security concerns, inside and out.